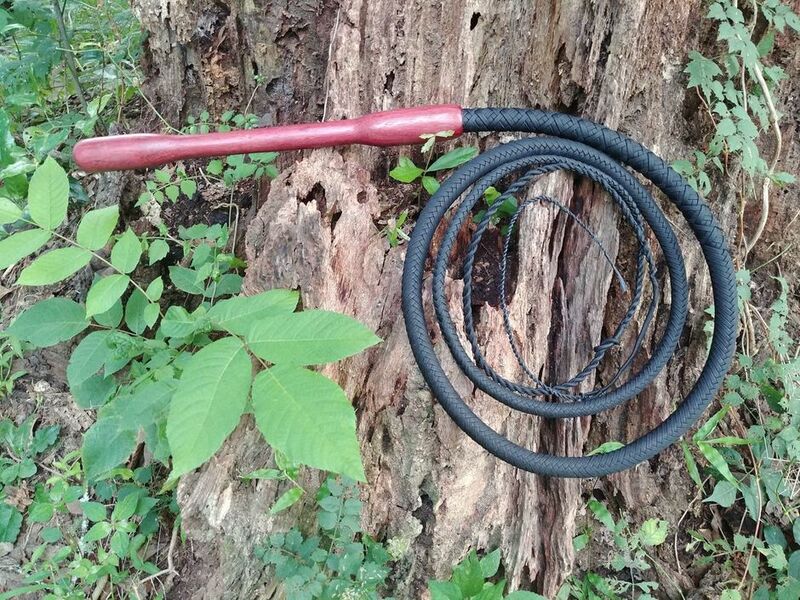 Originally invented by Robert Amper (see home page, and videos), it is my honor that this whip design bears his name. There are two versions of the Amper Style, with more information coming soon! The Amper Style features a very noseheavy (weight is forward to the tip) cow whip thong with two plaited bellies. 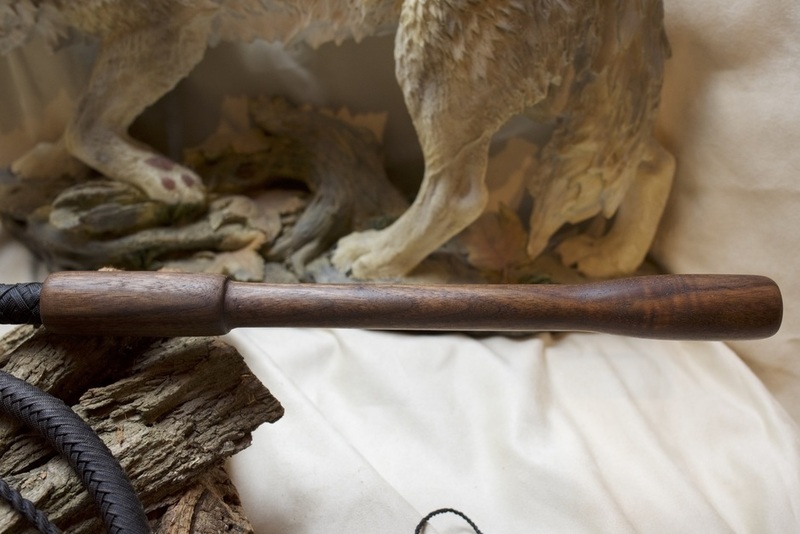 It has a little added binding at the transition, the thong is epoxied into a completely handmade exotic wood handle. 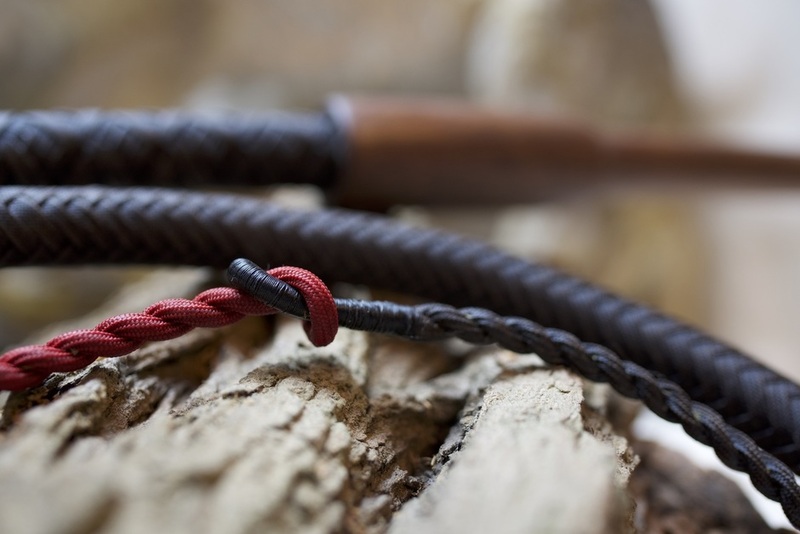 This whip comes with a stamped and signed certificate of authenticity for the handle which is numbered, three falls with quick-change cracker loops, (both weighted and non-weighted) and five crackers (tapered dyneema-style and tapered sinew). 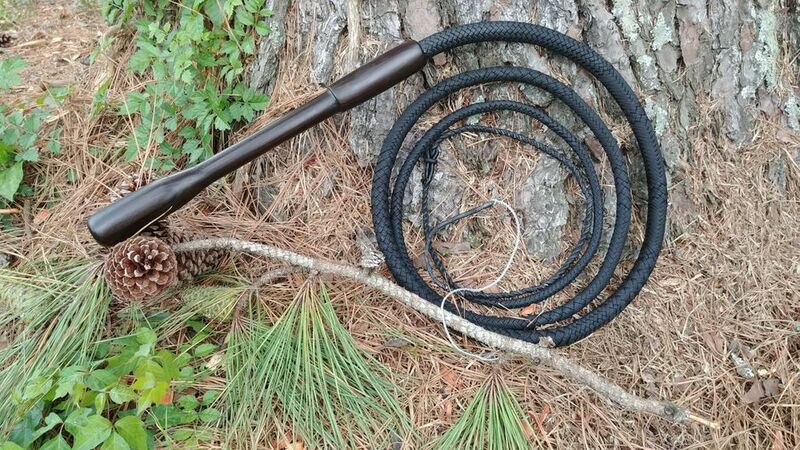 The fall hitch can be Traditional, Cow Whip Twist, or an English Eye/English Eye with a Twist. 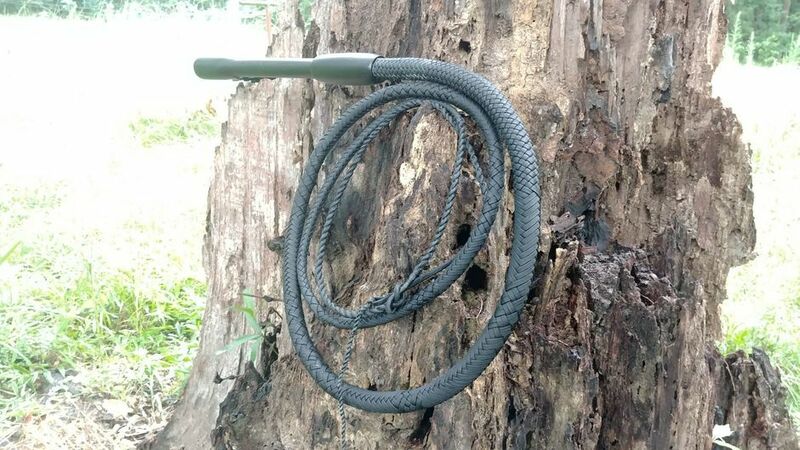 The Amper Style Elite bears the same numbering system as the Amper Style, the difference is the plaiting patternwork and options to pair with my other whip lines in a matching set. 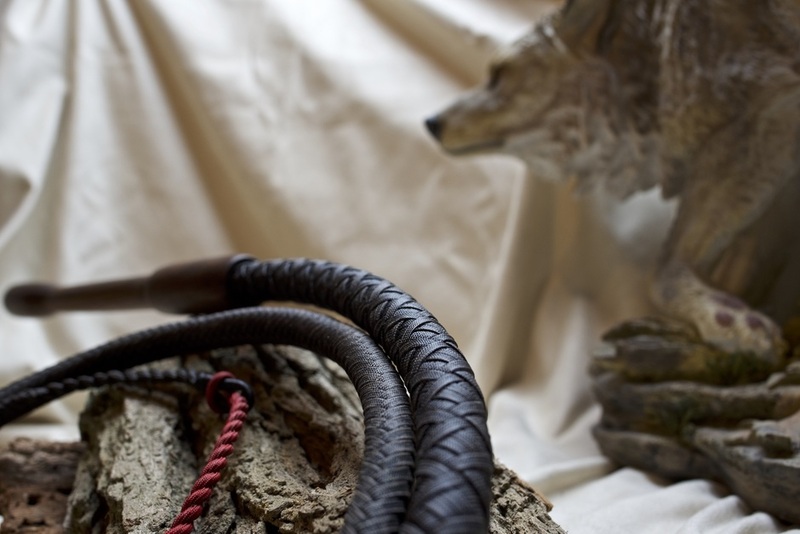 Handles: These handles are completely handmade. 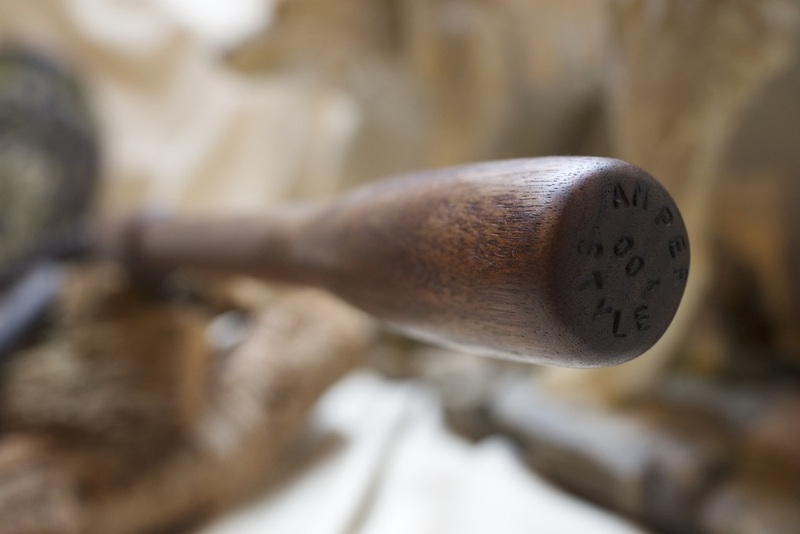 It takes from 3-5 hours, depending upon the wood species, to complete each handle. I use a drill to hollow the cup, otherwise it is all hand tools. A rasp, a vise, a layout compass, a pencil. Sandpaper. Handmade. 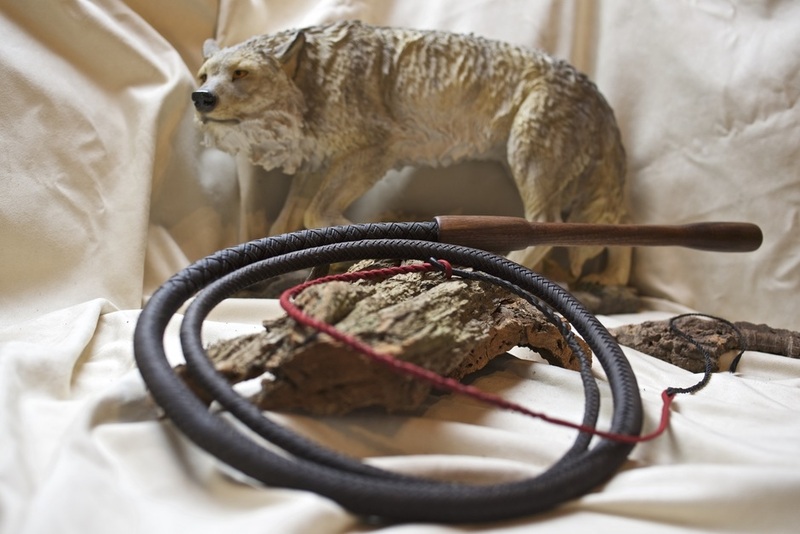 #002, Acid Dark Brown 7' 16 plait with two plaited bellies, featuring a Cow Whip Twist Fall Hitch. 14" handcut Cumaru handle. #003 Black, Charcoal Gray and Crimson 6' Amper Style 16 plait with two plaited bellies and an English Eye with a Twist. 14" handcut Figured Jatoba handle. 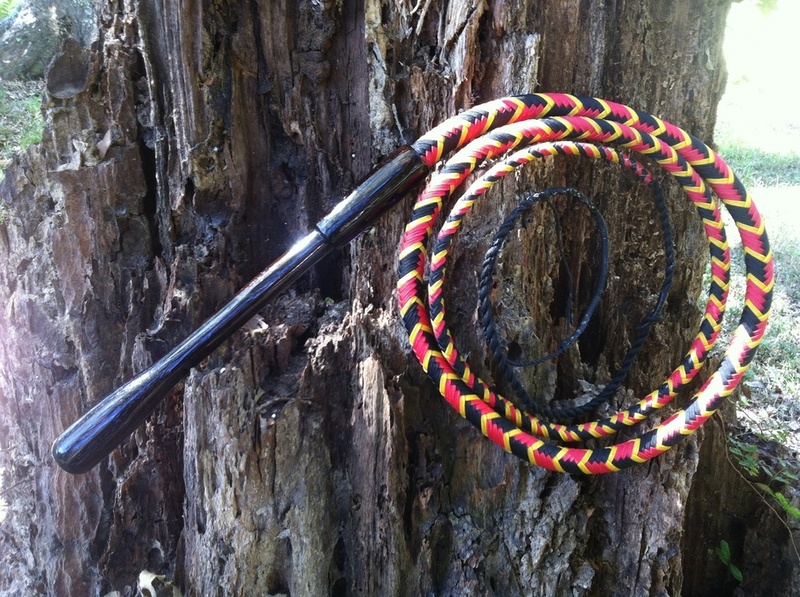 #004 Black, Yellow, Imperial Red 6' Amper Style, (This pattern is not available with an English Eye) 14" Wenge handle. #005 Black with Burgundy accent. 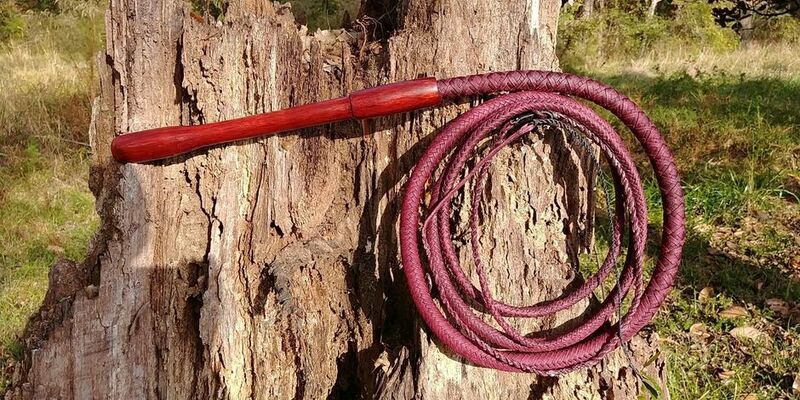 6' 16 plait Amper Style with Twisted English Eye, 12.5" Purpleheart handle. #008- 6' with 14" Bocoté handle, in Rust with Midnight Blue accents.